Oh it is getting closer… a great day is upon us! 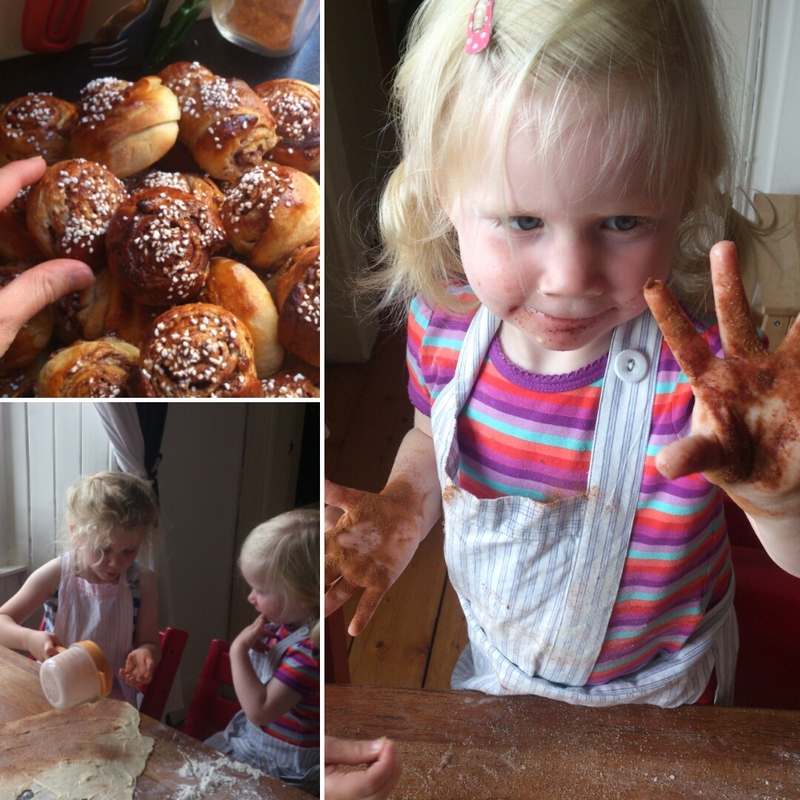 Cinnamon Bun Day or as we say in Sweden: Kanelbullens dag! 4th October is the day and yes of course this weekend we will bake at home. Here are some facts by The Local that might be worth knowing. Buns are super tasty and should be eaten warm (just out of the oven kind of fresh) and with a glass of cold full fat milk! So if you have never made them, well what’s stopping you? Why not give them a go this weekend. There are million of recipes out there, I personally prefer them super sticky and sweet with a hint of cardamom. Some people struggle to find fresh yeast (I have baked with dry yeast once…did not like it) however most local shops if they have a bakery will be able to sell you fresh yeast. My local Sainsbury’s do, I just head to the bakery smile and say please and 50g cost me about 20p. Well worth the money. So here is a the basic standard recipe you can find on the packet of plain flour in Sweden. Now in Sweden we use dl which is decilitre. Apparently according to google 1 dl is 100 ml (well is that not convenient). Right so this is how you do it. Crumb the yeast in to a large bowl, pour the warm milk on top and stir, let the yeast dissolve. Add small lumps of butter, sugar and cardamom. Add flour but save about 1 dl while working the dough on a baking table later (ok I had never sifted anything in my life before I move to the UK so you do not have to do that at all). Let it prove, covered of course and out of draft for about 30 min. So make this dough then do your school run or enjoy a coffee or whatever you like. Work the dough on a baking table easy for a few minutes, divide it in to 4 parts. Use a rolling pin and make a rectangle shape. Not too thin but definitely not too fat. Thinner rather than fatter. Roll them up as you roll up a swiss roll and cut in to 10 pieces . Put them either in large paper cases or on a tray covered in baking paper. Cover with towel and let prove for approx 40 min (do not cheat on the prove time). Beat the egg and glaze the bun, we put a very typical sugar on top called pearl sugar and no I can not find it here. I buy it when I am home in Sweden, it will be fine without! Buns in the middle of the oven for about 5 – 10 min. 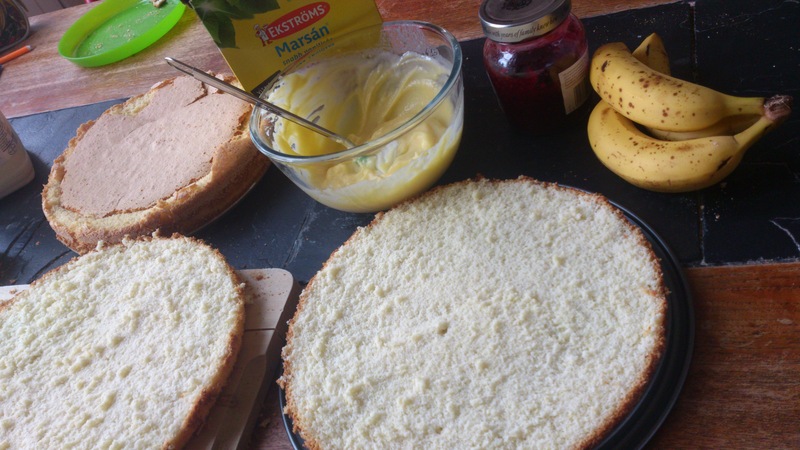 Now you can use what ever filling you like, nutella, marzipan, jam…go for it! If you leave them for a couple of days and they go a bit dry, pop them in the oven for a few min with a little lump of butter on top. And I like to defrost them in the oven with a little lump of butter. Mum had this trick back in the day before she stopped eating sugar. She took a couple out of the freezer and then put them on top of the coffee maker while brewing the coffee and a lovely smell of coffee and cinnamon spread in the house (we all have our tricks). Now you better eat a bun this weekend! If you have an big blue shop nearby they have some “fake” buns (as my friend called them) in their food bit. They taste fine, never as good as homemade but I would not turn them down. And of course if you are local to Edinburgh you have Peter’s Yard, they are a bit here and there now in town. Lovely lovely bakes and the coffee is rather good too. Enjoy! Ah lovely sunset over Edinburgh! 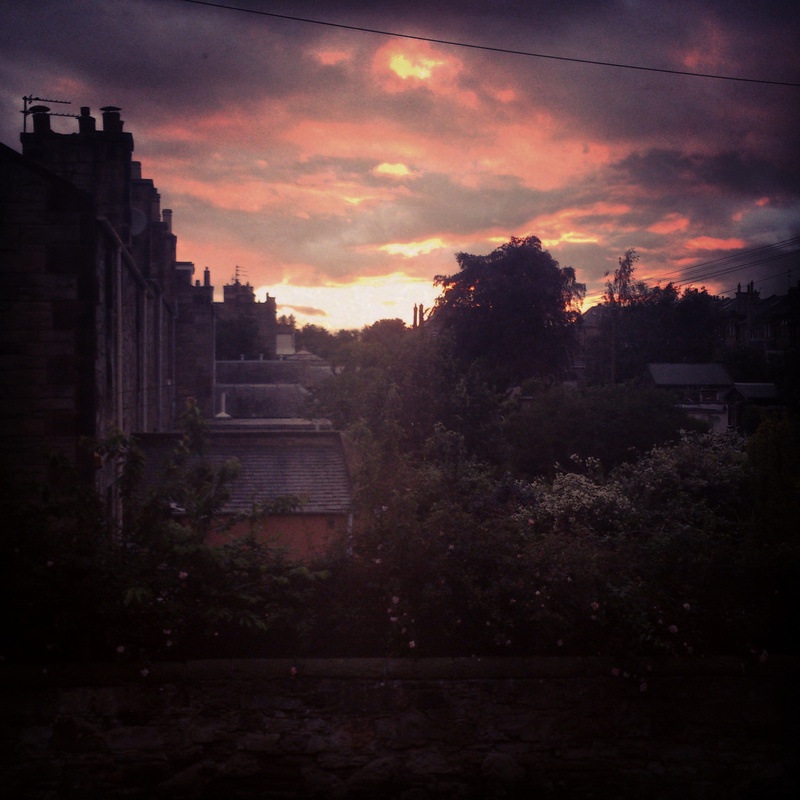 Edinburgh have amazing sunsets and I can sit in our dining room and just stare out the window, it is like the sky is on fire. We have had a busy day today, Zuzanna received a delivery from Cult Design with lovley new pattern designs for our Change tealight holder range. And lots and lots of Father’s will be quite happy on Sunday with some pretty amazing gifts. Don’t forget we still have our great offer on until Sunday. 15 % off selected items. Richard has been working late today and just arrived home so the girls and I have baked and baked and played and climbed the sofa up and down, great fun when you are 14 months, and of course watched a film while it rained outside this morning. I am not a great cook, I can cook but just not very inspirational or exotic. Mainly all I have in mind is that it needs to go quick, do everyone get enough vegetables, do they actually eat it and so on. So obviously we got a few winners and when I do try new things…well there have been a few disasters. However lately I started to follow a couple of blogs from Sweden and one blog is absolutely great! Jennys Matblogg, a girl my own age, living in a house that I consider a dream home and in a very lovely part of Sweden (no I am not jealous at all). I feel so inspired and I have tried a few new things. Check out her blog, yes yes I know it is in Swedish but hey there is google and just let me know and I shall do my best to translate. I am glad that if I actually follow the recipe as I should it turns out pretty good and I have had the comment “mmmm yummy” from my picky three and half year old which is very positive. I grew up in a home where we ate what was served and I eat everything (NOT Marmite) and I was quite determine to never raise picky children…damn, did not turn out that way! Stina is not a great eater…she is a snacker and if I make dinner into a picnic then she will eat it. But fruit and vegetables are a struggle so we try new things all the time. She helps me while cooking, grating, chopping, stirring but refuse to try eating it, we do sticker charts and everything but she is just not having it. But lately she has gotten better and we try to encourage to at least try and she is now eating a few more vegetables. I wonder if it helps that I am more interested in cooking and maybe introducing more different kind of foods. Anyway today we have baked a little for next weekend when we are off to a Midsummer party, the freezer is quite full. I made a carrot cake, a long time since I did that which is a shame because it is very simple, guess I just been lazy thinking that grating carrots is a bit boring but seriously it takes no time what so ever especially when you have two girls that entertaining you at the same time and make you smile. And after the girls were asleep I made this beauty! It will come with us tomorrow (Richard is working overtime tomorrow as well) to Glasgow. I am looking forward to relax, Stina will be so happy to spend the day with her cousin and I think Lovisa will be looked after by aunty, uncle and grandparents so I guess I can eat cakes and relax! Sounds like a good day to me! So here it is, as requested! 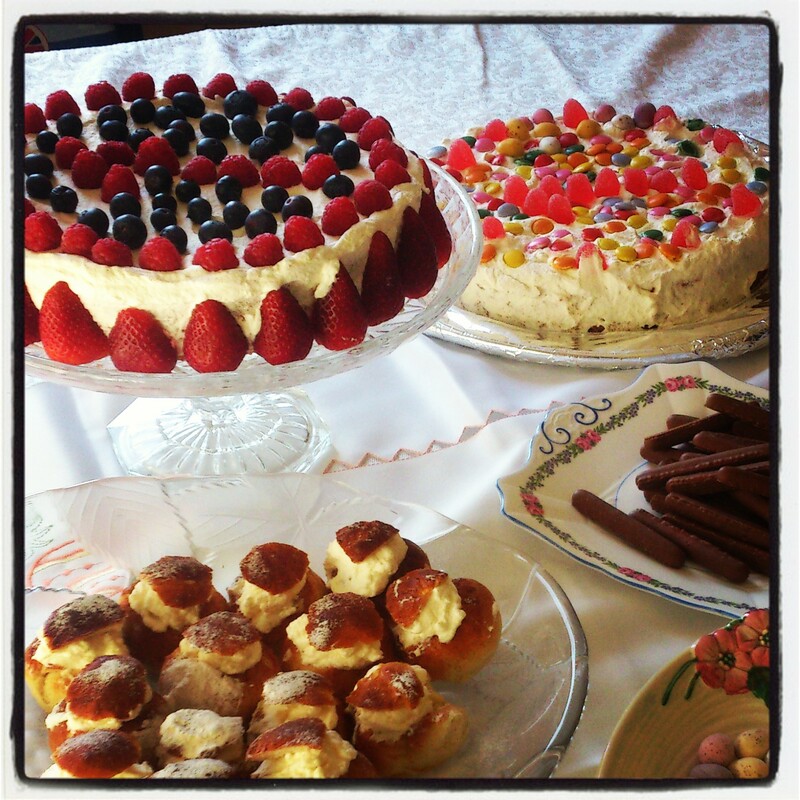 This is the recipe I use when I bake our Swedish Birthday Cream Cakes. 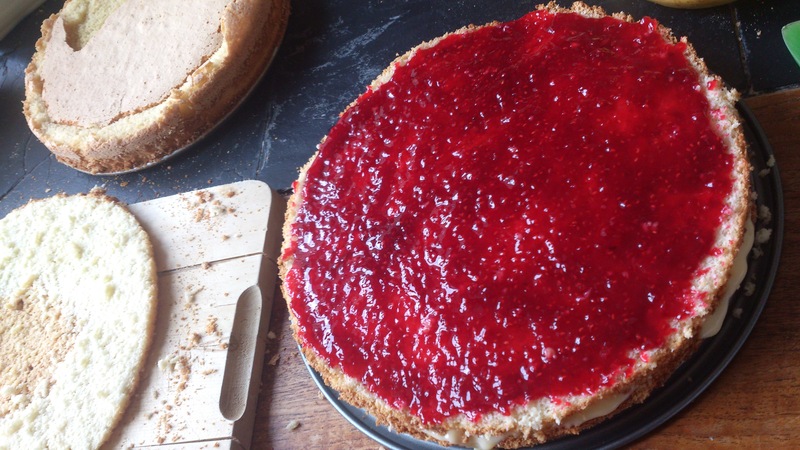 Of course there are lots and lots of other options but I normally stick to this recipe for the base since it is so easy and taste just like I remember my birthday cakes did when I grew up. This base you can use for any kind of cake. Does not have to be for a round cake, can be any kind of shape or size. Basically more classic I guess with the round ones. I am not sure if Stina will have one of these for her birthday in the Autumn…maybe if I make it pink and shape it into a princess…hmmm I don’t think I shall put too much energy into that thought just yet! Beat eggs and sugar until light and fluffy, then add the water little by little while whisking to make sure you don’t get scrambled eggs. Then add the dry ingredients swiftly and pour into a cake base approx 24 cm. Pop in the oven at 175°C for about 30 min. Then let it cool down and prepare to cut in three layers. First layer I normally make a vanilla custard, I have been lazy and bought special powder back home. But before I did that I used a light custard with a vanilla taste which was a little bit heavy but had the right flavor. It needs to be a vanilla cream but a bit heavier but honestly feel free to use whatever you like in the your cake. Middle layer can be whatever you like, I normally use a nice jam. I am a raspberry jam kind of person but apricot or strawberry is lovely too. Mashed banana or just fresh berries is nice too. Oh lots of options! Top layer is whipped cream which nicely hides all my mistakes. And then topping, whatever you like. 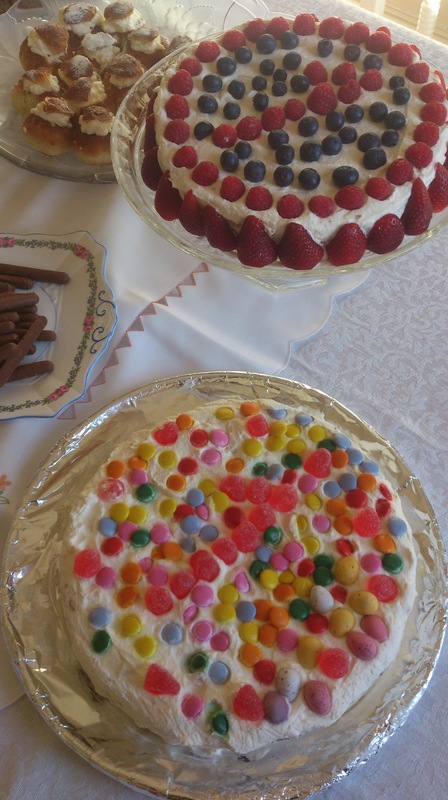 I like the ones with berries since the cake is so sweet and heavy it is nice with fresh berries but the rest of my family likes sweeties. So smarties, chocolate buttons or what you have at home. I guess for midsummer it is all about strawberries so anything else than strawberries is illegal! One made by the 3.5 year old and one by me. Before I moved to the UK I used to bake a lot and I thought I was pretty good at it too, I guess I was more experimental and really enjoyed it. However now these days, time and oh my goodness just looking at the cakes makes me put on weight so sadly I am not baking as much. 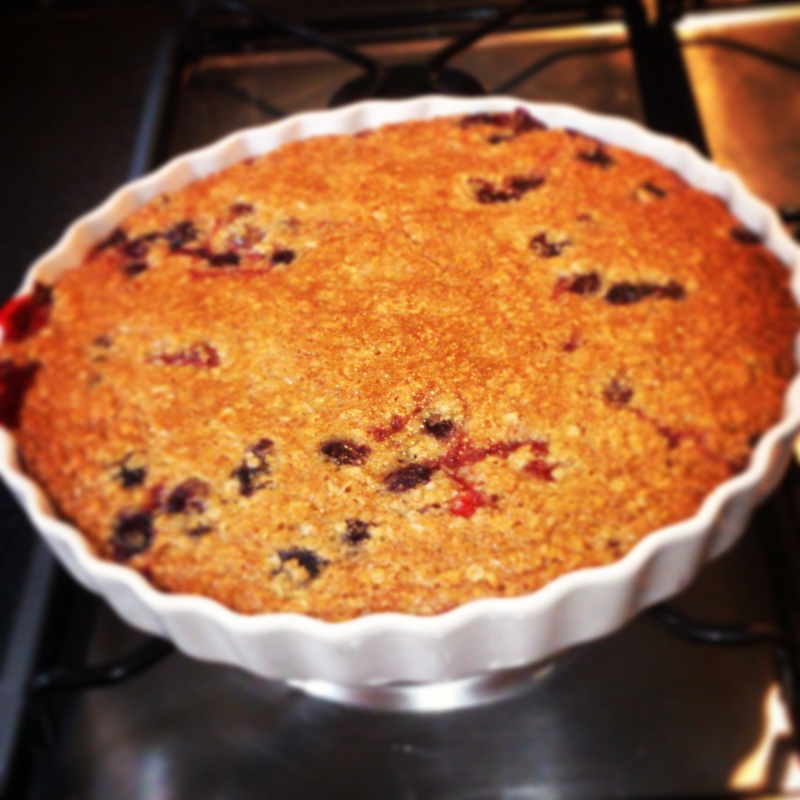 But when I do Stina helps me and I think it is more about a little us time than how perfect my bakes are. I used to do one alternative to this cake which was soooooo tasty but made you feel a little bit sick! Vanilla custard layer and a chocolate mousse layer and then on top instead of cream I melted chocolate and topped it with raspberries! My younger sister Cecilia is known for making amazing cakes and she is always asked to bake for some other family members special days. Hopefully I can get her to bake me something this summer when we are home or for my special day!